Who’s excited about SEO? I am, and you should be too. SEO is not difficult, but it will take time and patience. We’ll start with the basics to make sure you have a solid foundation of building an early SEO campaign. This should be well intertwined with your overall marketing plan as it’s crucial to the success of your business, especially if you are running completely online. Search Engine Optimization is (according to Wikipedia) “the process of affecting the online visibility of a website or a web page in a web search engine’s unpaid results—often referred to as “natural”, “organic”, or “earned” results.” In layman’s terms, it’s the process by which you increase web traffic without paying for it. There’s several ways to do this, but we’ll start with just a few. First, you want backlinks. Backlinks are a case in which outside websites will reference or ‘link back’ to your website, resulting in organic traffic to your site. This will help to validate your content, establish a level of credibility with your readers and ultimately, build authority on topics. For example, let’s say I’m writing a blog about email marketing. I reference part of a blog from Hubspot, a notable marketing industry leader. You see by linking to Hubspot’s blog, I’m helping direct traffic to their site, therefore creating organic traffic (because the reader found their way on their own and not through a paid advertisement) and helping to build their reputation as a credible source of information for writing blogs. A more technical look shows that getting backlinks to your blogs can help provide two main types of authority: page & domain. The more other sites link to your site, it will help strengthen the value of your page and bump your domain up on the Google search list. Actionable Takeaway: Create valuable content. Know what your audience wants to read and write about it. The more you write to their desires, the more they will engage with you and share your content; increasing traffic along the way. Actionable Takeaway: A major culprit in page load speed is image size. Your images should be no larger than 75KB on average. Certain images, the hero for instance, is an exception and can run around 250KB. If you’re just starting out, a lot of page load improvement s such as keeping scripts below the fold, optimizing CSS, compression and browser caching may not apply. 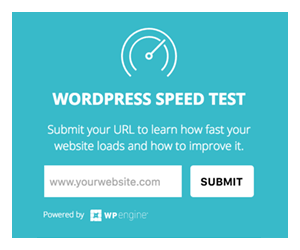 If you are using WordPress, you won’t have as much control over this. Test your page with Pingdom.com which will run a full analysis on your website. It provides instant insights into your website’s availability and performance. And webpagetest.org which actually load your page with a virtual browser and give you immediate actionable insights. Lastly, double-check your H1 and title tags. The header tag, or the <h1> tag in HTML (title tag), will usually be the title of a post, or other emphasized text on the page. It will typically be the largest text that stands out. They’re important because they let readers know what information will be present when a user clicks on a page. Actionable Takeaway: Work your keywords into a title that’s also compelling for readers. These tags hold the strongest weight on Google search pages, in terms of headers on your site. How? Content, content, content. Utilize the resources you have at your disposal. This means email marketing, blog posts, infographics, etc. Focus your writing and design around your audience’s knowledge seeking. These are great for engagement and excellent for SEO performance. Actionable Takeaway: Start incorporating more non-branded keywords into your site. For example, if your company is Xerox, your non-branded keywords would be copy paper. Tools like Keyword Planner by Google Ads, is great for discovering related keywords to your brand. Your ranking on search engines is partly based on how popular your website is, and popularity is measured by page views. The more clicks your page gets – or, in other words, the higher your CTR – then the more valuable the search engine deems it to be. So your page will naturally rank higher. Conclusion? Higher CTR equals better SEO. – Post listicles! Readers love lists. With just a few simple steps, you’ll be driving traffic to your site in no time. Research your keywords, incorporate them into everything (without being spammy – Google knows the difference) and pay attention to your site. Google analytics is your best tool. Make sure you monitor all pages to see what pages are working or not. Remember, achieving good SEO is simple, but it’s not easy. Your goal is to have a fast website with clear user experience and no broken links. Every page should be unique and have high value to the searcher.